Growing up on a farm in Canada, my boyhood hero was Billy Graham, and along with him his beloved song leader Cliff Barrows. I admired Cliff from afar, but in recent years I got to know him personally and we developed a warm friendship. He and his wife Ann listened to Running to Win faithfully every morning. I found him to be humble, approachable and an encouragement to everyone he met. 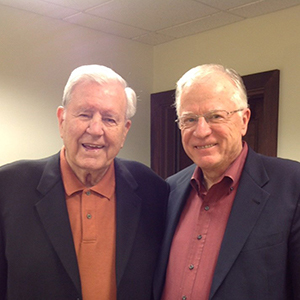 A few years ago he invited me to speak at his seniors retreat at the Billy Graham Cove in Asheville, North Carolina. With his eyesight now dim, the songs he led for so many years in the Crusades were frequently on his lips; he quoted them, sang them and cherished their message. His Christian character and grace made an indelible impression on me. As Billy Graham used to say, there will be no need for preachers in heaven but Cliff will be leading a choir, rejoicing in the worship of our Lord and Savior. No doubt when Billy joins him in heaven they will reminisce about the wonderful time they had sharing the gospel with so many. Thanks Cliff, for blessing millions in the Crusades, and blessing individuals one on one with the same kindness and warmth. Running to Win Goes Spanish! There are no Scripture references.